Dimensions (HxWxD): 40" x 25" x 23"
The Swingline™ CS50-59 strip cut shredder is the top of the line commercial shredder; its features meet the needs of busy workplaces. The Swingline™ shredder is TAA compliant, thus meeting the government's requirements for purchasing. 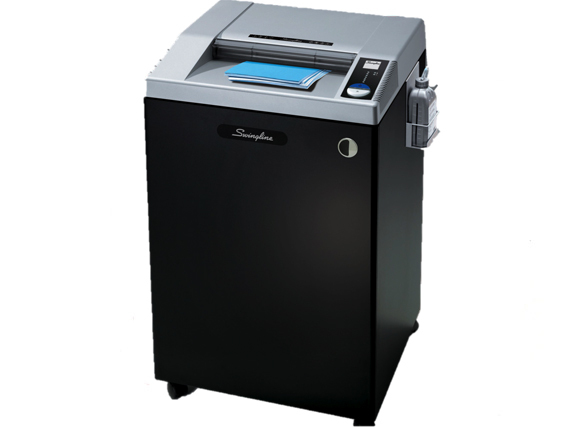 The Swingline™ shredder shreds optical media, credit cards, staples, paper clips, and paper. Thanks to its wide feed opening, the Swingline™ CS50-59 strip cut shredder can shred large document sizes. The Swingline™ shredder's advanced Jam Stopper® technology clears paper jams by automatically reversing the jammed paper. The Jam Stopper® shredder is one of the few Swingline™ shredder models that is driven by a chain gear; enabling smooth shredding of large jobs. The Jam Stopper® shredder's automatically oiling of the cutting blades ensures longer lasting blades. The Swingline™ CS50-59 strip cut shredder's thermal overload protection protects the motor from getting hot. The Swingline™ shredder can shred continuously without the need to cool down. The Jam Stopper® shredder has a wire-frame waste bin; when the Swingline™ shredder's bin gets filled up, the bag full indicator will indicate it. High shredding capacity ensures more productivity. Large feed opening makes it perfect for shredding large sized documents. Jam-Stopper® technology prevents paper jams. Chain drive gears enable it to shred through large jobs. Automatic oiling of blades ensures blades perform for a long time. Continuous shredding feature results in greater production. Large waste bin saves on accessories expenses. TAA compliance makes it suitable for government agencies and educational institutes.